Children learn and become more familiar with the names of Joseph's brothers with this fun Guess Who type game. 1. Before class print out the Brother's Patterns. 2. Tape the two pages with the large figures together to make a game board and display it in front of the room. 3. Cut the smaller figures apart to make cards. 4. In class display the game board in front of the class. 5. Pick one child to be the leader and have him pick one of the cards. 6. The other children should take turns asking yes or no questions to the leader. They may asks questions such as, "Does the brother have brown hair? or Does the brother have green eyes?" The leader answers the question and the child who asks the question gets to guess which brother he thinks is the one on the leader's card. If the guesser is correct, he gets to take a turn picking a card and answering questions. 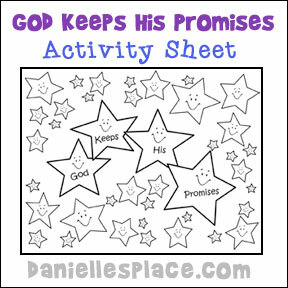 Have children color the star activity sheet and count the number of stars on the sheet. Give your students black construction paper and star stickers. 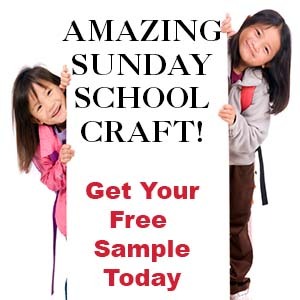 Have them write the Bible verse on the bottom of the paper with a white or light colored colored pencil. Tell them that Jacob brought over seventy family members with him to Egypt to escape the famine. When your children are done, tell them to count the number of stickers on their papers. Here's a fun way to learn the names of Joseph's brothers. 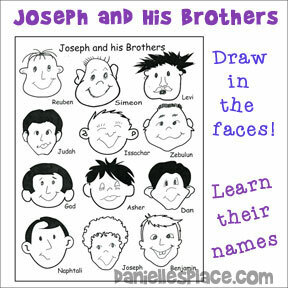 Children draw faces, or cut out faces from another printable sheet, and glue them onto different face shapes representing Joseph's brothers. Talk about Joseph's family. Genesis 36:23-27 gives you a family history. You can tell them that Jacob had four wives that had twelve sons between them and one daughter (Dinah). Use the activity sheet to play a memory game. Cut the faces apart and cover the names that are nest to the faces. Hold each face picture up and tell your children the name of the son. Tape the picture to the board. Ask your children how they might remember the name that goes with the picture. They might say, "Benjamin's two front teeth look like the letter 'B'" or "Zebulon looks like a bully and his name sounds link a bully," etc. When you have placed all the pictures on the board ask your children to pick out each face that goes with the names. If a child picks the correct picture, he gets to keep that picture. Keep playing until all the faces have been picked. The child with the most faces wins. The craft sticks are taped together so that when they are pushed together from the sides they fan fold up into a compact stack of sticks for storage. Unfold the stack and the disciples appear standing next to each. 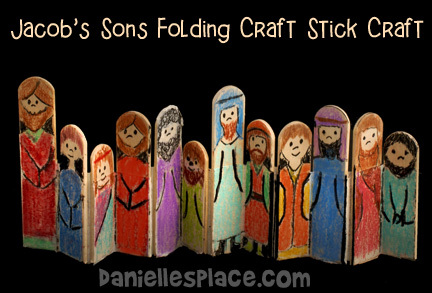 Children will enjoy drawing each of Jacob's sons and then writing their names on the back of the sticks. Mini Jumbo Craft Sticks 4.5"X.625" 50/Pkg (6-Pack) - Use good quality craft sticks that lay flat. The 5/8" work perfect with the one-inch tape. *You can use the Woodsies Jumbo Craft Sticks with the 1.5 Inch - 3M Scotch Masking Tape for a bigger Canvas. Permanent Markers, Crayons, or Colored Pencils - (The washable markers don't work well because they smear on the tape.) I used Prismacolor Premier Colored Pencils. These are very soft colored pencils that cover very well. The draw back is that they don't last as long as the harder colored pencils and they aren't cheap. 1. Cut the mini-jumbo craft sticks into two pieces. Vary the lengths so you don't have all the disciples the same height. 2. Place two sticks together, side by side, and tape them together covering both the sticks with the tape. You don't have cover the rounded ends of the sticks. 2. 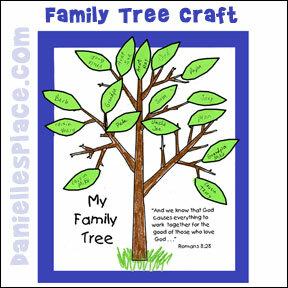 In class have your children color the tree trunks and write their family member's names on the leaves. Younger children will not know very many of their relatives, but they can just glue the leaves on the tree and have their parents help them write the names on the leaves later. Don't worry about putting the names in any kind of order like a real family tree. The idea is to just help the children think about how many people are related to them. 3. Talk about Jacob's family and how Joseph was used to fulfill God's promise to Abraham who was the father of Isaac and Jacob. Genesis 26:4 "And I will multiply your descendants as the stars of heaven . . ."
4. Talk to the children about Jacob's 70 family members who where in Egypt during the famine. Genesis 46:8-22 tells how many children each of his sons had. Challenge the children to come up with 70 relatives. 5. I challenged the children to take their trees home with them and have their parents help them write in the names of their relatives. I offered a prize to the child that brings back the tree with the most names. Pick one child to be Jacob. Jacob sits in front of the room with his back to the other children and closes his eyes. Place "Joseph" (a doll, bean bag, or paper doll) behind Jacob. Pick one child to sneak up and take "Joseph" and then go back and sit down hiding Joseph behind their back. All the children then say, "Jacob, Jacob, where's your son? Somebody took him, but who's the one? 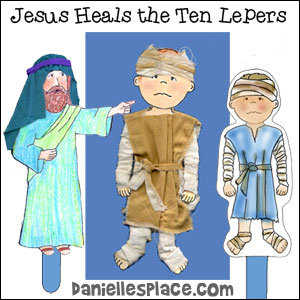 "Jacob tries to guess who took Joseph. If he is right, he takes another turn. If he is wrong, he takes the place of the child who took Joseph. Cut out star shapes and write the memory verse on the stars using one word per star. I used "He keeps his promises." Joel 2:13, five stars per child. Spread out the stars on the floor. Have the children sit on the floor around the stars. Take turns going around the circle letting each child pick a star. He must pick up the stars in order starting with "He". If a child doesn't pick up "He" the first time, he turns the star back over and tries again next time. Once he picks up the word "He", he will then try to find the word "keeps" and so on. The child that picks up all the stars in order first wins. You can then have the child glue the stars onto a strip of paper to take home and study. To make this game longer, you can ask questions about the story and then have the children pick up a star. 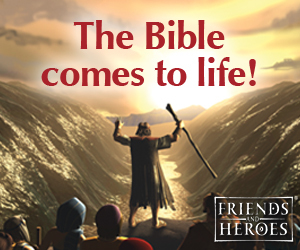 Older Children figure out the words to the Bible Verse by studying the pictures that depict the words to the Bible verse. 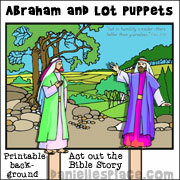 Go to the Abram and Lot Bible Crafts Page for Bible crafts, games and activities for this lesson. Plush Prayer Bears "Now I Lay Me Down To Sleep"